Our household budget template helps you to account for all your monthly expenditures such as food, utilities, and other household related costs. Our household budget worksheet is quite detailed in its approach. We have provided specific budget categories for you to track your monthly income and expenses. Categories listed are consistent with those shown in our other tools. However, you maintain the flexibility of changing the categories to fit your personal preferences. This monthly household budget template was created to encourage you to compare your budgeted amount in each category to your actual spending. Tracking the actual costs compared to a pre-planned budget provides the insight required to take full ownership of your personal finances. Your new household budget spreadsheet, or personal budget planner as some people prefer to call it, is a critical tool in your new financial arsenal. "The cold harsh reality is that we have to balance the budget." You are encouraged to take the time necessary for budgeting every line item on a monthly basis. The great news here is that much of the hard work is already done. This step won't take very long to complete since you already have most of the data at your fingertips from completing your personal financial statement during Step Three. However, be sure to double check the numbers just to ensure that your budget is reasonable and achievable. Using our household budget template, you now possess the means of planning in advance an entire month of finances. As soon as you've subscribed to The Leadership-Tools Free Newsletter, you have access to our entire leadership library. Don’t make the mistake of underestimating the value of this tool. By tracking all revenue and expenses to a monthly budget, you will greatly increase your chance of paying off your debt and begin building financial wealth. We never can get more out of ourselves than we expect. If we expect large things, if we hold the large mental attitude toward our work, toward our life, we shall get much greater results than if we depreciate ourselves, and only look for little things. The habit of expecting great things of ourselves calls out the best that is in us. No one can become prosperous while he really expects, or half expects, to remain poor. We tend to get what we expect and to expect little is to get little. Excerpt from: Prosperity - How to Attract It! The above message provides true wisdom; words to motivate and encourage you to achieve your financial goals. In addition to providing the necessary financial tools and resources, we wish to share inspiring words that will continue to motivate you to continue your quest to becoming debt free. "We must consult our means rather than our wishes." Define Your Budget - view your household budget spreadsheet as your personal plan to improve your financial life. Don't look at it as a task you must endure. Your mind-set is critical to your success. Know the Purpose of Your Budget - the main purpose of using a budgeting tool is to ensure that every month you live within your means. If you don't feel like you have enough money, your best option is to pay down your debt and make more money. During this course, you will learn how to do both. Be Knowledgeable About Your Money - the importance of knowing precisely where your money is coming from and where it is going cannot be overstated. Knowledge is power. By being fully knowledgeable about your money you will more easily and more consistently make better money decisions. Be Consistent in How You Organize - in Step Two you organized your financial documents, and you should be sure you organize your budget in a very similar way. 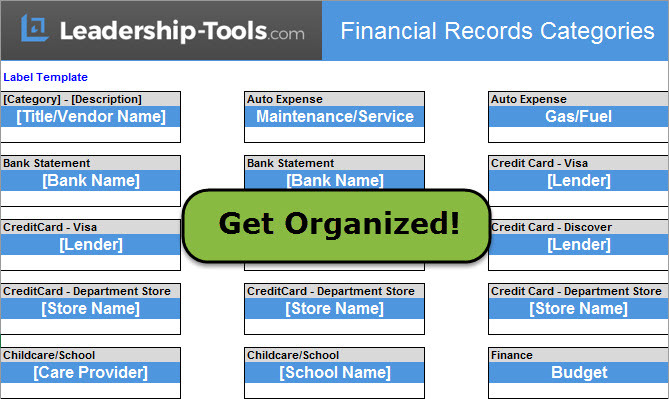 Doing this will make managing your financial affairs much simpler. Be Aggressive, But Realistic - while you want to use the budget worksheet to support attacking your debt, you also want to make certain you live within your means. Pay down your debt as aggressively as possible, but stay focused on meeting all your obligations each month. Check yourself regularly by comparing your budget to your cash flow statement and your debt stacker plan. 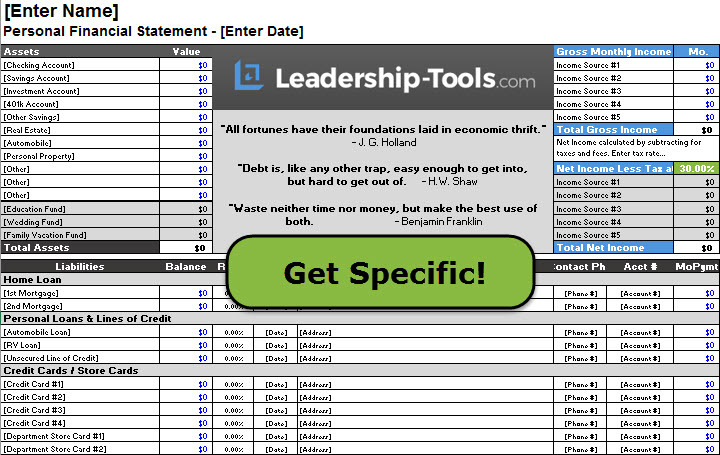 Spend Every Dollar on Paper First - the budget spreadsheet allows you to give every dollar that comes in a specific job. Decide the purpose of every dollar before it’s ever spent. 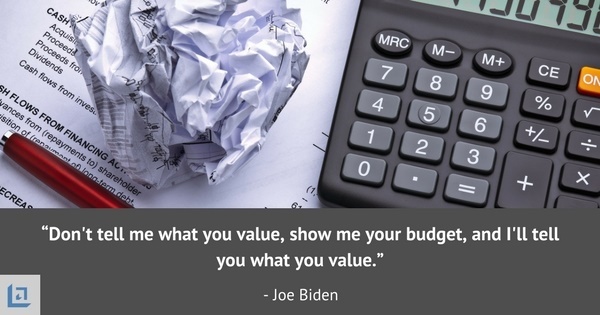 Spend your money on paper first – that is the goal of budgeting. As the old saying goes, "First plan your work, then work your plan." If You Slip Up, Get Back Up - don't allow a mis-step to be an excuse for quitting. If you mess up and do not meet your budget the first month, figure out what happened, adjust your budget, and restart for the next month. You can't fail - unless you quit. At first you might view the budgeting process as too simplistic, but keep in mind that you wouldn't be reading this if you didn't need to make some important financial changes. Using our free household budget template and other financial tools, as you follow the steps that we have outline, you will discover a renewed confidence and peace of mind as you manage your personal finances. 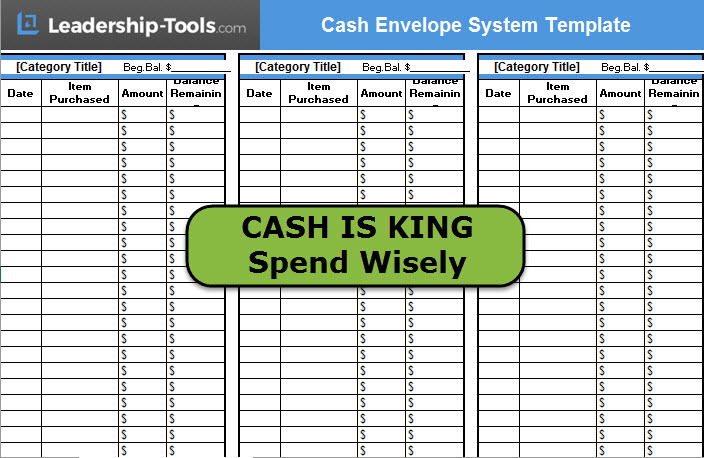 In Step Seven our ebook, 10 Steps to Conquer Debt, we'll provide another proven strategy that shows you how to ensure you never overspend – our Cash Envelope System is just one more arrow in your financial quiver to help you be successful. 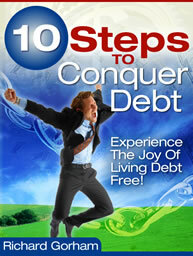 To download our free 10 Steps to Conquer Debt eBook, simply subscribe to our free newsletter. 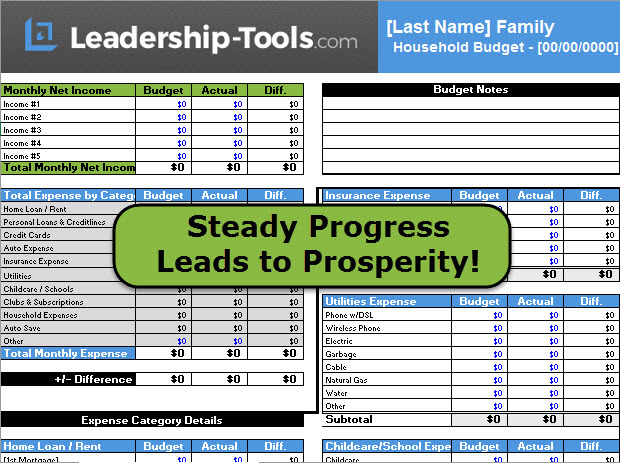 You will immediately receive a password that grants access to our entire leadership tools library, including our household budget template to manage your monthly expenditures. Getting started on your new budget is simple and straightforward. Begin getting your financial life in order today.